This stick seat is constructed from aluminium and plastic, making it extremely lightweight to carry and corrosion resistant. It folds easily away, turning into a stick that can be used for support when walking. This stick seat is constructed from aluminium and plastic, making it extremely lightweight to carry and corrosion resistant. 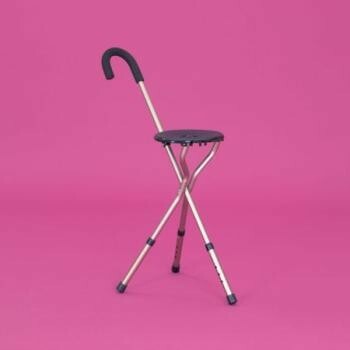 It folds easily away, turning into a stick that can be used for support when walking. The most stable seated position is with the handle between the users legs. Handle height 845 to 950mm (331/4 x 371/2"). Seat height 455 x 540mm (18 to 211/4").